Eslanda Cordozo Goode Robeson, also known as Essie, was an anti-racist, anti-colonialist, anti-capitalist, and feminist born in Washington, DC on 15 December 1895. She received a scholarship from the University of Illinois and later transferred to Columbia University to receive her BSc degree in Chemistry. It was at summer school at Columbia that she met Paul Robeson and in 1921 they were married. A staunch opponent of injustice, Eslanda found her intellectual community and political point of view in New York, where she was located in history on the eve of the Harlem renaissance and the end of the Bolshevik revolution. 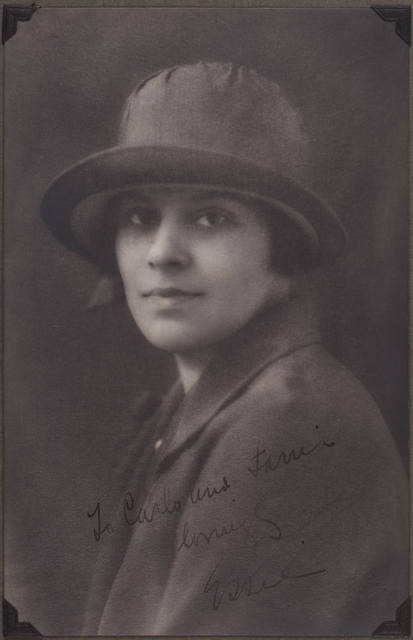 After receiving her degree in Chemistry, she became the first histological chemist of surgical pathology at New York Presbyterian hospital and worked there until 1925. In Eslanda: the large and unconventional life of Mrs. Paul Robeson the author Barbara Ransby describes Eslanda as the architect of Paul Robeson’s singing and acting career, after she changed her plans to become a doctor, to be his manager. His popularity provided the couple with the opportunity of performing all over the world. By the 1930s Paul and Eslanda Robeson moved to London where their careers flourished. Eslanda Robeson was featured in three films, and studied at LSE from 1933-1935 and in the Lent term of the session 1937-38. At LSE, she studied under Bronislaw Malinowski, the Chair of Anthropology, who was considered one of the most important anthropologists of the 20th century. At LSE her classmates included Jomo Kenyatta, the first president of Kenya. There she developed her interest in Africa. One of her seminal works was the text African Journey. In this text, she published an anthropological piece that differed from many publications around Africa by calling for an African independence and not pathologising Africa. She opposed the notion of African primitivism and refused to substantiate these types of racist claims, which were rampant in early 20th century anthropological research. Her political point of view was black autonomy and there was also a globalised emphasis on liberation. She saw the interconnectedness of oppressed peoples and often drew upon the image of a common humanity. Her pan-Africanism led to involvement in the Council of African Affairs, along with WEB Dubois and Paul Robeson, where they pushed for autonomy in Africa. In 1945 Eslanda Robeson received her PhD in Anthropology from Hartford Seminary School and continued in her opposition to injustice. 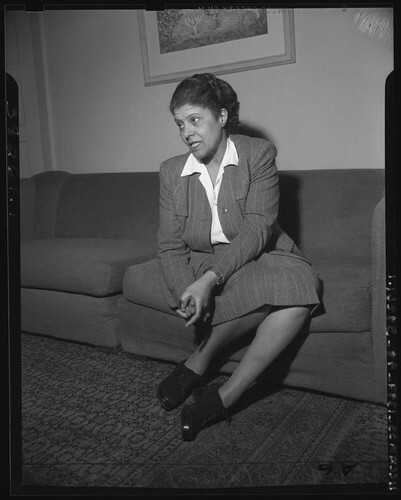 In 1951 she interrupted the United Nations postwar conference on genocide supporting the Civil Rights Congress petition stating that “the lynching and other forms of assault on the lives and livelihoods of African Americans from 1945 to 1951, especially the frenzied attacks on returning black American veterans, amounted to genocide.” According to Gerald Horne’s Paul Robeson: the artist as revolutionary, it was these revolutionary tactics that garnered attention and outrage from the international community and provoked investigations by the US Congress into her Communist sympathies (Rummel, 171). Both Paul and Eslanda were questioned and testified before Congress, Paul for his friendships and Eslanda for her text African Journey. As a result of their politics, their passports were confiscated and for the next eight years Paul’s income declined drastically due to his inability to travel. After 1958 their passports were returned and Eslanda attended the All-African Peoples’ Conference in Ghana. There she met leaders like Kwame Nkrumah who had also attended LSE. She died in 1965 in New York from breast cancer. Eslanda Robeson was a unique black woman of her time, who engaged in transnational politics and saw the importance of a globalised perspective. At a time when most African American women were domestics, her story offers a unique point of view on the unraveling of Jim Crow, the Harlem Renaissance, World War II, the Cold War, and the rise of fascism. Contributed by Sherese R Taylor (graduate student, Department of Sociology, Howard University). Read her review of Paul Robeson: the artist as revolutionary by Gerald Horne on the LSE Review of Books. Ransby, B. (2013). Eslanda: the large and unconventional life of Mrs. Paul Robeson. New Haven: Yale University Press. Rummel, J. (2003). African-American social leaders and activists. New York: Facts On File.